Filmmaker and SF State alum Lisa Cholodenko (B.A., '87) was honored at the 67th Annual Director's Guild Awards Dinner on Sat., Feb. 7, for "Outstanding Directorial Achievement in Movies for Television and Miniseries." Cholodenko won for her direction of the HBO miniseries "Olive Kitteridge," based on the Pulitzer Prize-winning novel of the same name. The miniseries stars Oscar-winner Frances McDormand as the title character, a retired schoolteacher in small-town Maine. 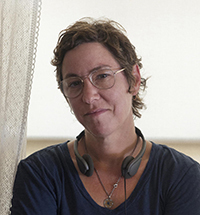 Alum Lisa Cholodenko was honored for directing the HBO miniseries "Olive Kitteridge." Cholodenko is best known for the 2010 film "The Kids Are All Right," which she wrote and directed. The story of a lesbian couple navigating a new relationship with their children's biological father received critical acclaim, including Oscar nominations for Best Picture, Actress, Supporting Actor and Original Screenplay. Cholodenko described how her experience at SF State prepared her to succeed as a filmmaker when she was inducted into the Alumni Hall of Fame in 2013. "My experiences at the University and in the city absolutely shaped me and gave me the foundation for all my future aspirations," Cholodenko said. "At San Francisco State, I learned that passion might get me further than practical pursuits. I'm grateful for the eclectic, transformational education it provided me." Cholodenko's next big project debuts on Feb. 12. She directed and executive produced the NBC miniseries "The Slap," in which an all-star cast -- Uma Thurman, Peter Sarsgaard and Thandie Newton, among others -- tackles complicated family dynamics.